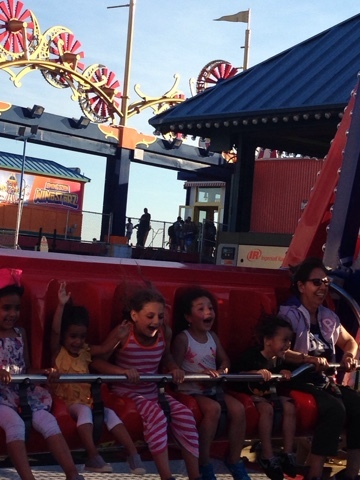 We've been to quite a few amusement parks this summer and guess who's been having the very best time! The bumpier and faster the ride, the better. Is it a second child, freer spirit, more independent kind of thing? She barely meets the height requirement for these. 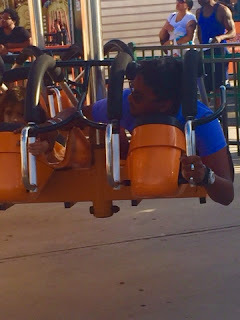 On this ride, she asked me to stay back and let her go on by herself. 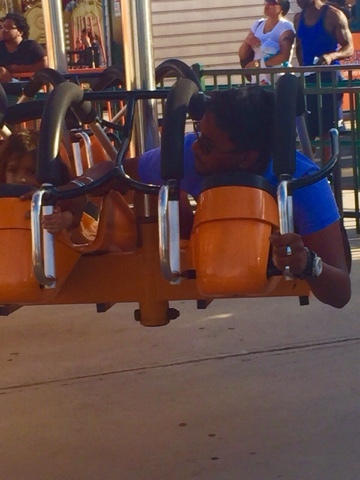 My cousin was more scared than she was on this ride! And this one! The hands up in the air- seriously!! I dunno but my heart certainly skips a beat seeing her on all these thrilling adventures! So much fun! G is just now getting to where she can ride the rides and I love it! Lol that is SO awesome. My oldest is by far my thrill seeker and she is insanely tall too. Some of the rides she went on when she was only 2 are crazy. Love that she is loving and enjoying life so much and you caught it on camera too! Love this! That's how I was when I was little. I rode my first big roller coaster when I was 6 and haven't looked back since. The taller and crazier the ride the better. I hope my kids are the same way!